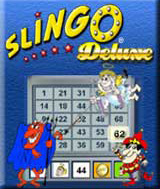 Slingo is the unique and exciting combination of classic favorites Bingo and Slots. It was first developed as a traditional 5-reel slot machine in 1995 and then one year later, it became one of the biggest multiplayer online games on America Online. This new Slingo is the very first downloadable version of the game that will let you play without being online. It features sharp graphics, saved stats, top ten lists, custom backgrounds plus a brand new challenging game mode called PATTERN. The Slingo experience appeals to anyone who enjoys playing games, winning prizes and having fun. Comments: Like all slingo games if youhave not tried these games they are great, but watch out for the devil!